May 13 commemorates two great interventions of the Mother of God in the twentieth century: Her appearance to the shepherd children at Fatima in 1917, and her intervention in St. Peter's Square in Rome to save a bishop in white from what should have been a fatal bullet in 1981. 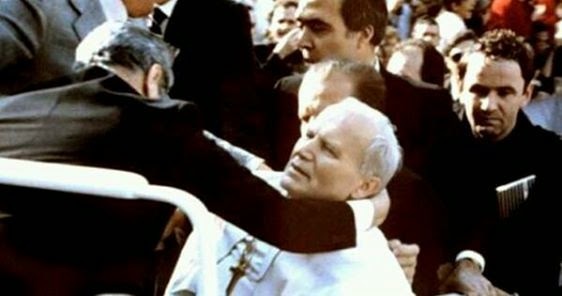 Saint John Paul II confessed his faith with his blood on May 13, 1981, and the Virgin Mary saved him for the sake of the Church, and the world. Thank you, Merciful Mother Mary! Thank you for preserving your devoted son who had entrusted everything to you, the bishop of Rome whose motto was "Totus Tuus." Thank you for making of him a great gift to all of us, as a voice in the night, a light in the midst of so much darkness. Again I have become indebted to the Blessed Virgin and to all the patron saints. Could I forget that the event in Saint Peter's Square took place on the day and at the hour when the first appearance of the Mother of Christ to the poor little peasants has been remembered for over sixty years at Fatima in Portugal? For in everything that happened to me on that very day, I felt that extraordinary motherly protection and care, which turned out to be stronger than the deadly bullet." Anyone who has lived from that day to this day should know that it's worth it to trust in that motherly protection and care, and to have confidence that Jesus is in charge of His Church, always. Pray the Rosary... and don't worry!